One of the most common asked questions we receive is if Shiba Inus shed a lot. Majority of people have the misconception that they do since there are numerous articles on the Internet stating that they do. However, we would disagree with that statement. We would disagree with this statement simply because our Shibas, both puppies and adults, live in our home and do not shed all that much. Just about everyone who has a pet Shiba Inu has them living indoors. Therefore they would not develop a thick winter coat to shed off in the warm months of the spring. 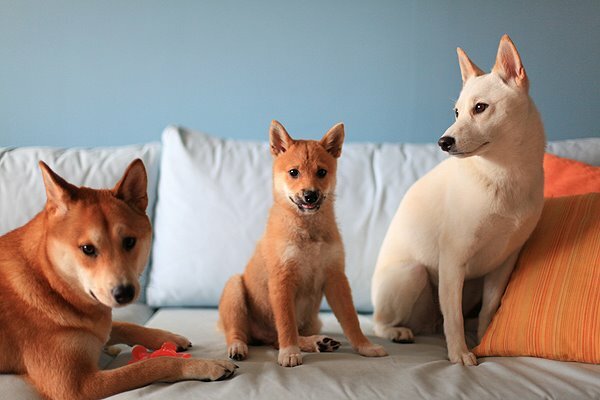 However if you look at the Shiba Inus in magazines or in the show rings you will notice that they have thick fluffy coats because it is a very desirable look. They are kept out in below zero temperatures in order for the fur to get thick and fluffy. The average pet owner would not do this, as their Shiba would be sleeping indoors in the heat. In the summertime these fluffy Shibas will blow their coat in which they will shed all the fur that they developed in the winter. If your Shiba is not kept out in the freezing cold temperatures during the winter then he or she will not shed at all or blow their coat in the spring. Shiba Inus are very clean dogs and keep themselves groomed on their own. You will never have to brush a Shiba for this reason. Copy Link: Do Shibas shed a lot?